This news item was posted in E, Ear, Pain category and has 0 Comments so far. The Eustachian tube is a small canal that connects the middle ear (behind the eardrum) to the back of the nose and upper throat. Its purpose is to equalize the air pressure in the middle ear with the outside environment. Eustachian tube dysfunction (ETD) occurs when the tube fails to open during swallowing or yawning, which results in a difference between the air pressure inside and outside the middle ear. It causes discomfort in the ear, hearing problems and will usually result in fluid accumulation behind the eardrum. It often occurs when you experience altitude changes from events like flying in an airplane, driving on steep hills, riding in a fast moving elevator, or scuba diving. The symptoms can usually be relieved by swallowing, yawning, or chewing. 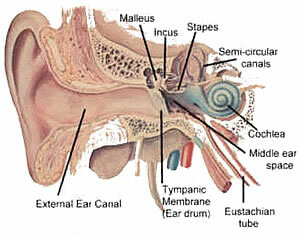 ETD occurs if the tube is blocked or swollen, trapping air and fluids in the middle ear. This causes symptoms to continue beyond a few hours and can sometimes lead to ear damage. ETD is usually caused by nasal congestion from an allergy, cold, or other upper respiratory infection and sometimes by ear or sinus infections. Some people develop ETD because they have a narrow Eustachian tube. Sometimes the Eustachian tube can be mechanically blocked by adenoid tissue in young children or by tumors in adults. Children have a higher chance of developing ETD because their Eustachian tube is narrower than that of adults. Your doctor will ask about your symptoms and medical history, and perform a physical exam. A lighted instrument called an otoscope is used to look inside your ear. The doctor will check for a slight bulge outward or inward of the eardrum, as well as fluid and inflammation. If your case is severe, your doctor may refer you to a specialist in ear disorders (otolaryngologist). To deal with ear clogging, discomfort, or pain the typical treatment has been Nasal or oral decongestants, oral antihistamines, or nasal steroids. These medications have been used to try and relieve nasal congestion and enable the Eustachian tube to open. If pain relief is needed, you can use medications such as acetaminophen or ibuprofen. In some cases, if the Eustachian tube does not open with other treatments, a myringotomy may be necessary. The doctor makes an incision in the eardrum to allow the pressure to equalize and the fluid to drain. The EarPopper device is the latest treatment for opening the Eustachian Tube without any medication or myringotomy surgery. The EarPopper opens the Eustachian tube naturally with air. The air is delivered through the nose and diverted up the Eustachian tube while the person swallows. The entire treatment only takes a few seconds – and it only occurs when you swallow while the air is blowing. This treatment is known by Otolaryngologists as the Politzer Maneuver and is more commonly called Transnasal Eustachian Tube Inflation. First discovered in 1860 by world famous Otologist Adam Politzer, he discovered that the Eustachian Tube could be opened safely and effectively with the right amount of air pressure and air flow. The EarPopper is a modified Politzer Device that is simple to use by anyone suffering from ETD.